Hi! I accidentally deleted the entire ‘Camera’ folder this morning on my Galaxy S4 running 4.4.4. Is there any way to undelete my Galaxy photos? My phone has been rooted. Although Samsung Note 7 is a typical failure, there is not many dispute over other mobile devices of Samsung, especially the Galaxy series, like S7/S6/S5/S4/S3/Note 5/4. Many people take photos with Samsung Galaxy phones on vacation or daily life, but, unfortunately, not all people make backups for phone data regularly, which often turns out to be a bad and dangerous habit. If you accidently delete some precious pictures from Samsung by mistake or after an unwilling factory reset, there is still one way to retrieve deleted pictures on Samsung Galaxy internal memory or SD card. Deleted Samsung Galaxy photos can be retrieved only before they are overwritten. If you delete images, screenshots or gallery photos from Samsung Galaxy, here are some tips that would help you get them back. 1. Try to find any possible backup for the deleted Samsung phone images. 2. Don’t use your Samsung phone, especially not for saving big size files, to avoid overwriting. 3. If there is no backup for lost Samsung photos, then find a Samsung photos recovery software. 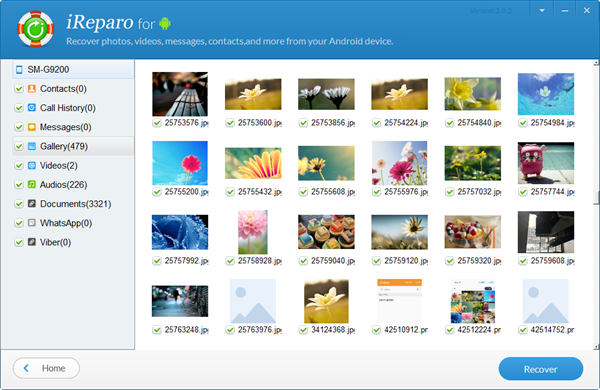 iReparo Android Data Recovery is the best Samsung Galaxy photo recovery software. It can retrieve photos, videos, contacts, messages, WhatsApp, Viber and other phone data without backup. It supports Samsung Galaxy S7/edge, S6/edge, S5, S4, S3, Note 5, Note 4, Note 3, Galaxy A/E/J series, and other devices running on Android 2.1 to 7.0. Please free download this Galaxy photo recovery software to your computer. It offers format filtering options, such as JPG, PNG, GIF, BMP for photos, and more for other data. It can recognize most handsets and restore data from them in short time. It is super easy to use with straightforward guides on the interface. Here is a brief instruction of iReparo Android Data Recovery. Step 1. Install and run iReparo Android Data Recovery. Step 2. 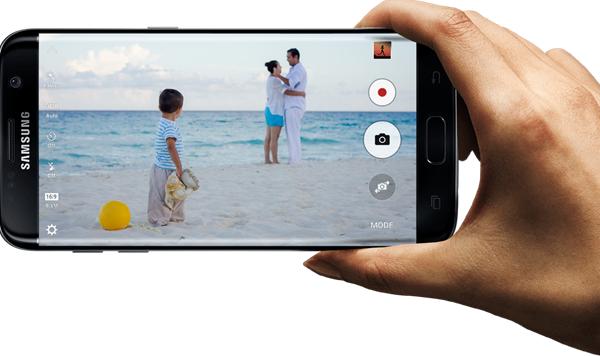 Select Multimedia, then set formats for lost Samsung photos. Step 3. Connect Samsung phone to PC. Step 4. Scan deleted image files on your Samsung. Step 5. Preview and Recover deleted photos from Samsung Galaxy. After the Galaxy photo recovery, the program will lead you the exported folder where you can view or move the recovered Samsung photos. In addition to photos, iReparo Android Data Recovery can also recover Samsung Galaxy contacts, audio, video,and other data, but you’d better always backup phone data to PC or cloud.